Click on a link below to view the website. UPCYCLING - What is up cycling or upcycling? Taking an item that is used or considered ordinary and making something new, nicer and of more value. This is what we have done with the discarded 55 gallon steel drums that are used in our Haitian metal art wall décor. We have upcycled the steel drums. View pictures of our experiences with the Haitian earthquake. 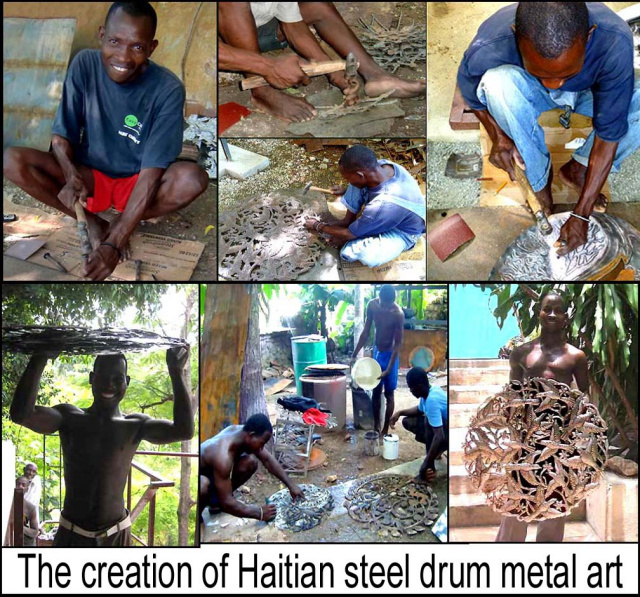 Having lived in Haiti for over 30 years and working in the arts field, we have become acquainted with and work with many of the top metal drum artists in Haiti. If this is your first encounter with this art form, we would like to introduce you to Haitian metal drum art. As you look through the photos of the ethnic art and wall decor, we are sure that you will come to appreciate the artistic skill represented by Haitian metal artists. If you are already familiar with Haitian drum art or are a collector of steel drum art, you will appreciate the decorative designs and metal wall hangings shown, and will want to add something to your art collection. In the creation of Haitian metal art, recycled 55 gallon metal oil drums are cleaned, split open and flattened to form a surface to draw the detailed designs. 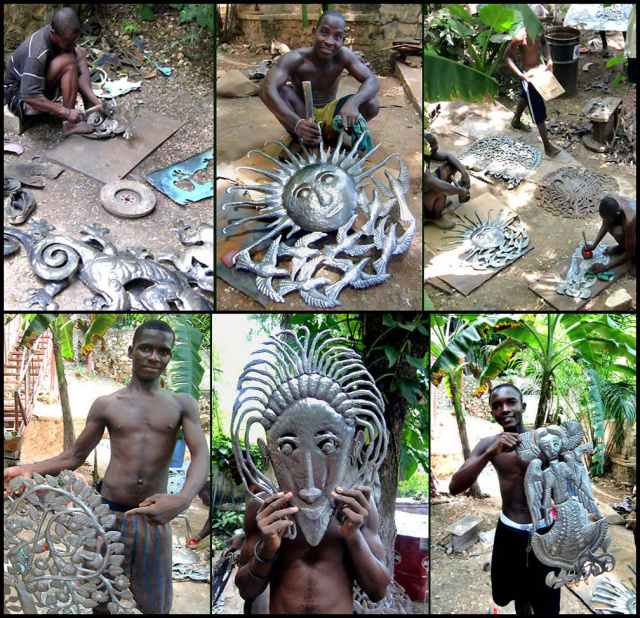 With common hammer, chisel and a nail, these amazing pieces of Haitian metal art are created. The results are all in the talent of the steel drum artist. You will enjoy reading the more detailed information at About Haitian Metal Art. Any of the metal wall hangings shown within are sure to be a special focal point of your home , office or garden wall decor, due to the uniqueness and the artistic skill exhibited. These outstanding Haitian metal sculptures will be appreciated by your friends and acquaintances. 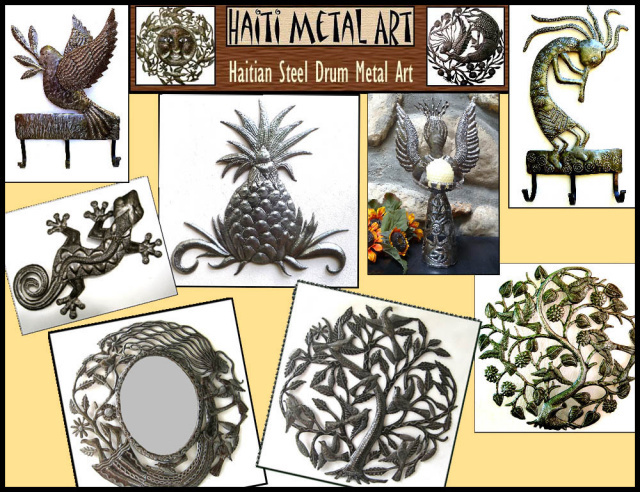 So now, we invite you to work your way through the various categories of Haitian metal oil drum art that we are presenting. You will find wonderful decorative metal wall art, angel wall hangings, traditional tree of life metal designs, steel drum sun designs, Haitian forkloric metal wall hangings, a large selection of mermaid metal art and much more. Enjoy the unique ethinc art that is presented ! I was so impressed with my beautiful 17 x 34 Angel, that I ordered two more pieces (a different Angel and a Mermaid) in the same size to go along a long entry wall in my bedroom. These are beautiful, very detailed pieces of artwork, that just glisten as the sun hits them. Even though the pieces are light, the metal is strong and not flimsy like the ones I’ve seen sold locally. The prices are great and my piece took about 10 days to receive. I look forward to unpacking, and hanging my two new ones. was involved in making this fine piece of wall sculpture. Haiti Metal Art is proud to offer fine qualtiy Haitian steel drum art to our customers. The metal art of Haiti is appreciated worldwide. What a wonderful concept, to create metal sculpture art from recycled steel oil drums. Click to see more pictures of the making of Haitian Steel Drum Art. Haiti Metal Art accepts major credit cards plus PayPal on our secure website.